We have run hundreds of influencer campaigns—from $5,000 experiments to million dollar investments and what we have learned is that there is an art and a science to making sure you hit your goals. Hand us a calculator and call us Picasso because we bring expertise in both areas to every campaign we run. Your money is our money, and we aim to spend it as efficiently as humanly possible. With over 50,000 influencers in every possible vertical, we work with brands on everything from beauty to beef jerky. We leverage hundreds of millions of proprietary data points to make sure you get the most out of your campaign. A beauty brand needed help launching a new product targeted at women over 45 so we identified influencers with a 70% audience match. It’s still the brand’s top influencer projects to date. For a major beauty brand launching a new lipstick, we helped find, manage and host 25 international influencers in NYC. 3 days later, our reporting showed over 250+ million impressions. A major beauty brand needed something special: two sets complete with smoke machines & hundreds of flowers. The results were some of the most engaging photos on influencers' feeds. Need some help figuring out how to tell your brand story? We’re an idea factory when you need one. We don't want to get sued and we don’t want you to either, which is why everything we do is FTC compliant. Yes, we are a technology platform, but we’re hands-on with our campaigns every single step of the way, from choosing the right influencers to paying them. 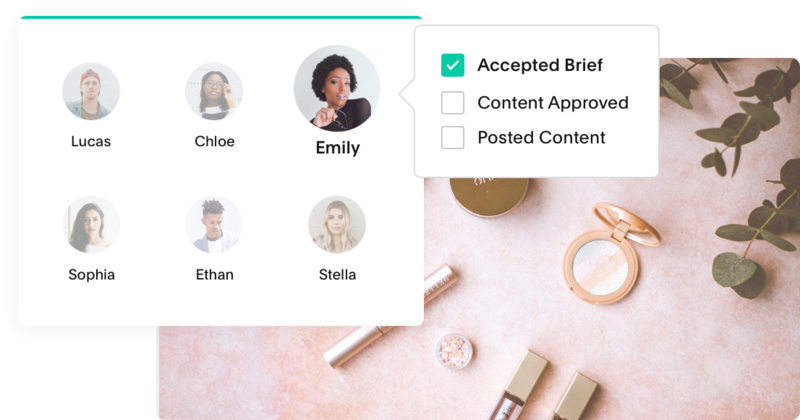 Our Verified Reach tool tells you if an influencer is reaching who they say they are. Your campaign shouldn't be a gamble. So no more rolling the dice. We execute small to large scale, complex campaigns in such a seamless way that you hardly know we’re there--from 5 influencers to 4,000, we take care of onboarding each and every one of them. See how Timberland used influencers from the city streets to the great outdoors to keep their #ModernTrail campaign top of mind from February to June. Look: we want your business, and we know we can make your life easier and your campaigns a little bit more lovely. You can drop your email and we we'll reach out.